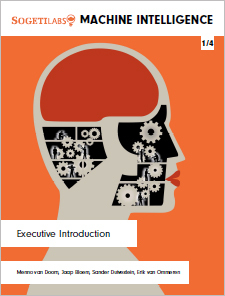 Today SogetiLabs launches its first report on a new wave of automation: Machine Intelligence. As part of a series of four, SogetiLabs Research Institute VINT, explores this Next Big Thing in IT. You can download our first report on Machine Intelligence for free from this location. The idea that an artificial brain could compete with that of humans lives for many years. In 2016, it’s exactly sixty years ago computer scientist John McCarthy suggested to work on Artificial Intelligence (AI) with ten men for two summer months on the campus of Dartmouth College. And now there’s this excitement in the market: after decades of working on concepts, the tools finally are ready to realize that vision. We are developing new cognitive systems, self learning computers, computers that can speak in human language and get to know us better than anyone or anything else. This new wave of automation is cause for numerous speculations about our future. Many science fiction classics are based on this theme. For instance Arthur C. Clarke’s “Dial F for Frankenstein” from 1964, in which the telephone is born as a little baby, and as it becomes more intelligent, it starts to dominate our society. Among others, Elon Musk, Bill Gates and Stephen Hawking alert for such effects of “true” AI. But men’s relationship with machines can also be very warm and affectionate. Startling example; the recent success of Microsoft’s chatbot Little Bing. Millions of people in China confide their deepest secrets to this machine. It is no coincidence that we are now putting this old issue high on the IT agenda. There are two simple explanations. First of all, there is a breakthrough in the field of the hardware. Watson, who beat the two champions of the TV game Jeopardy, has since shrunk from room-filling to the size of a pizza box. And today we’re talking about creating a super brain that fits into the smartphone. This remarkably high computing power means that the concepts from the past will now shape the future. The second explanation for the excitement has to do with the amount of data. Only ten years ago we started to move to the proverbial second half of the chessboard. This is the metaphor that Andrew McAffee uses in his book “The Second Machine Age”, to explain that data grows exponentially since 2006. That is crucial, because Big Data is the sine qua non for the artificial brain. Therefore, the self learning capabilities of intelligent machines (machine learning) could only start to develop the last few years. Machine Intelligence (MI) is the term to use nowadays. With an impending breakthrough of machine intelligence, the interesting question is what change that will bring. When will the Internet of Things change our cities?